How to draw a molecular structure? "Draw": Allows to add atoms (alone or connected to other atoms by bonds), modify the chemical element of an existing atom, and change the type of bond (single, double or triple bond). This mode is the default one when starting the app. Title of Mol: Give a title to your molecule. This title will be used when the structure is saved. Element: Change the chemical element. Is used when creating new atoms or when clicking on an existing atom. Show atom label checkbox. This label are positioned on the top right corner of each atom by default. They can be located on top of the atom sphere by clicking the Labels on top checkbox. Hybridisation checkbox change the atom label into the hybridisation of the atom as recognised by the Universal Force Field (UFF). UFF Optimize: Perform an optimisation of the structure using classical mechanic and the Universal Force Field (UFF). Gamess HF/STO-3G Opt: If Gamess US is installed locally and is configure correctly (See the preferences pane of DrawMol app), perform an optimisation of the structure using quantum mechanics and the HF/STO-3G level of theory. The slider and text field below allow to tune a bond distance, an angle and a dihedral angles function of the number of atoms selected in the "Select" Mode. Save: Save the structure as a xyz file. Add to View: Copy the structure in the "View" tab. Add an atom of a given chemical element (chosen from the menu under Element) by clicking on an empty space of the window. Add a atom bonded to a previous one by clicking-dragging the mouse from a first atom toward an empty space. Add a bond between two existing atoms by clicking-dragging the mouse from a first atom toward the second atom. Change the chemical element of an existing atom. To do so, select the appropriate element in the menu Element and click on the atom you want to modify. You can also do a right-click on an existing atom and change the chemical element from the menu that appear (Only a subset of all the atomic elements is available this way). Modify the kind of bond (Single, Double, Triple) by clicking on it. At the beginning, the bond is defined as "automatic" (and appear translucent), which means that it's type will be determined when the program add Hydrogen atoms or when it pre-optimise the structure (see below). Clicking on the "Add Hydrogens" button to add all the hydrogen atoms at once. Clicking on "UFF Optimize" to do a pre-optimisation using classical mechanic and the universal force field (UFF). How to manipulate the molecular structure? Rotation: Click-drag the mouse. In the "Draw" mode, be sure to click on an empty space. Zoom: Drag the mouse up or down while maintaining the shift key pressed. The zoom can also be performed from the wheel of the mouse or from the trackpad. Roll: Drag the mouse while maintaining the shift-ctrl key pressed. This can also been achieved with two-fingers gesture on the trackpad. Click on several atoms while maintaining the shift key pressed. While maintaining the shift key pressed, drag the mouse to draw a rectangle. All the atoms and bonds within the rectangle are selected. Right-click on an atom. In the menu that appear, select either "Add to selection" to add this atom to the selection or "Select All Bonded Atoms" to add this atom and all the atoms that are somehow connected to it to the selection. Double-click or force click (with a Force Touch trackpad) on one atom to select all the connected atoms. Remove these atoms and bonds by pressing the delete key. Translate the group of atoms by pressing the ctrl key while dragging the mouse. Rotate the group of atoms around their centroid by pressing the alt key while dragging the mouse. Duplicate the selected structure by selecting the menu "Molecule" > "Duplicate" (cmd-D shortcut). Duplicate the selected structure by applying a precise transformation (translation and rotation) via the "Transform" button on the toolbar. Go the "File" > "Save Selected Molecule..." menu. From there, you can select between different file format: H5Mol (the native format of DrawMol), XYZ, CIF, PDB. Click on the "Export" button on the toolbar. Click on the "File" > "Export" menu (cmd-S shortcut). To undo one or several actions, go to "Edit" > "Undo" menu (cmd-Z shortcut). To unselect all the selected atoms, just click on a empty space of the window. How to create an input file for Gaussian and Gamess-US quantum chemistry packages? DrawMol has a tool to help you build a input file for various quantum chemistry packages. For now, Gaussian and Gamess-US programs are supported. 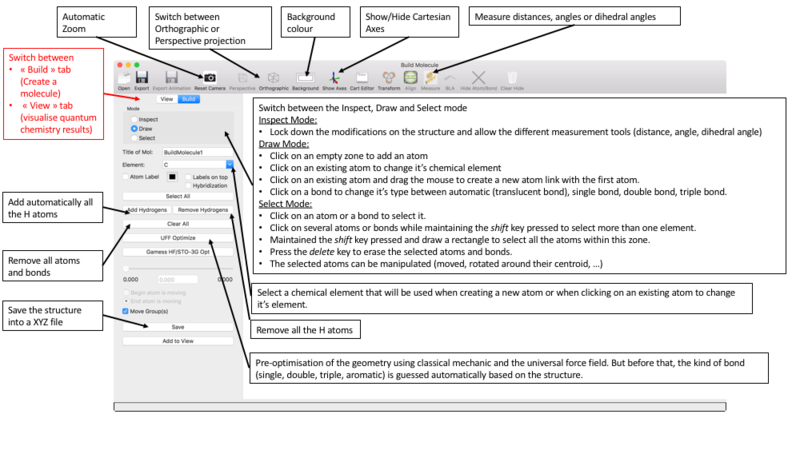 This tools can be found under "Molecule" > "QM Input Builder" menu. The quantum chemistry program for which the input file is created. The choices are Gamess-US and Gaussian. The method of calculation such as "RHF", "UHF", "MP2" or various exchange-correlation functional of the density functional theory (DFT). 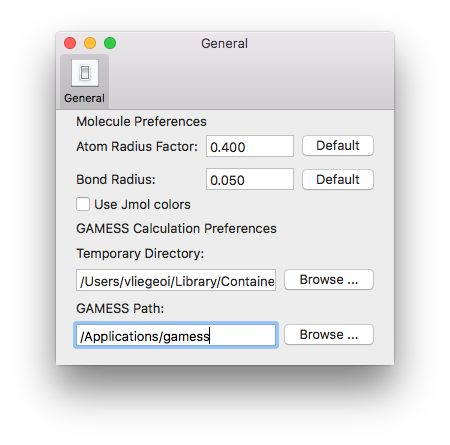 Gamess-US is a freely available quantum chemistry package that can be installed locally on your mac. You just need to register on the Gamess website and then copy the content of the Gamess package into the Applications directory of your mac. 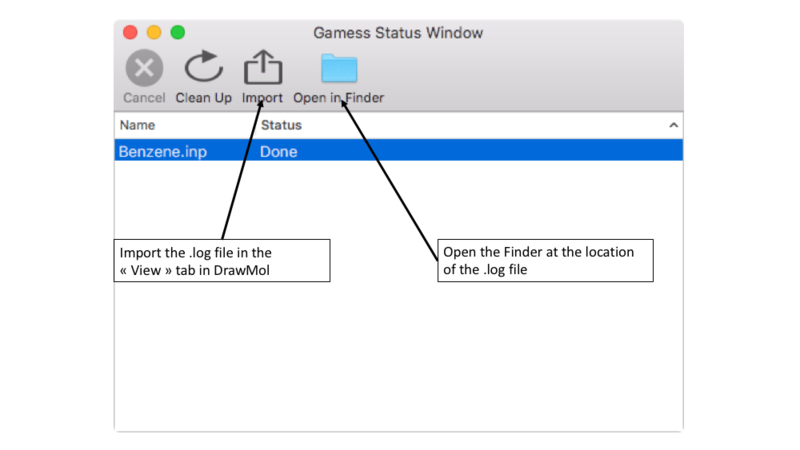 To use Gamess program within DrawMol, you first need to check the "DrawMol" > "Preferences" menu and modify the GAMESS Path to be the directory that contains the Gamess executable. To execute a calculation on your machine as a background task, click on the "Save & Run" button in the QM input builder tool. Then, chose where the file should be saved on disk and its name and click "Save". The job is directly launch in the background. To follow the evolution of your job, go to "Tools" > "QM Status" menu. Once the job is finished, the status becomes "Done". The final .log file containing all the Gamess results can be found in the same directory where you initially saved the input .inp file. TIP 1: From the QM Status window, you can either open the directory where the .log file can be found or directly import the .log file into DrawMol.